This week is OpWalk USA week across the USA. WOGO is thrilled to be participating, led by WOGO Surgeon Dr. Amanda Marshall-Rodriguez. We are thrilled that South Texas Spine and Surgical Hospital are working with Dr. Marshall-Rodriguez this week. While many of us may be lacing up our ski boots or sneakers and seizing the holiday spirit, millions of Americans today experience debilitating hip and knee pain that can affect their physical and mental health. Even the simplest of tasks we may take for granted – commuting to the office, lifting grocery bags, walking up the stairs, and picking up a child – can seem insurmountable. Even thought knee or hip surgery may be the answer, many patients may not be able to afford it and feel helpless in knowing where to turn or what possibilities may exist. That’s where Operation Walk USA 2018 comes in and can turn a life around. From December 3 – 9, 2018, an estimated 30 patients will receive free joint replacements from 40 volunteer orthopaedic surgeons at 25 hospitals. 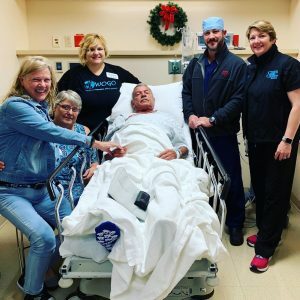 Operation Walk USA takes place each December as a humanitarian effort and allows for greater hospital, surgeon and medical staff participation. The program provides every element of treatment ─ surgery, hospitalization, and pre-and post-operative care ─ at no cost to patients who may not qualify for government health coverage, have insurance or afford surgery on their own. According to the Centers for Disease Control, nearly 23 percent of adults – or 54 million people suffer from arthritis. By 2040 that is expected to climb to 26 percent or 78 million of us. Arthritic disease is the most common cause of disability in the U.S., with the debilitating end stages of hip or knee degenerative disease making any movement or activity exceedingly difficult and near impossible. Operation Walk USA began in 2010 following the tremendous success of Operation Walk, an international volunteer medical service organization that provides treatment for patients with arthritis and joint conditions in developing countries. To date, nearly 800 patients received help through Operation Walk USA, held in the month of December, annually since 2010. Since its inception, Operation Walk USA has provided knee and hip replacement surgeries valued at more than $20 million. Device manufacturers DePuy Synthes, DJO, Smith & Nephew, Stryker, Total Joint Orthopedics, and Zimmer Biomet are donating the hip and knee implants for the 2018 Operation Walk USA. Surgery Partners has partnered with local physicians to establish South Texas Spine & Surgical Hospital. In this partnership, the physicians assist in management of the hospital, resulting in a hospital solely run for the benefit of the patient. This innovative approach creates an integrated and holistic approach to healthcare. As a nationally recognized center for spine and joint care excellence, STSSH takes pride in providing the highest quality clinical care in a one-on-one, warm and caring environment. For additional information, please visit www.southtexassurgical.com or like us on Facebook. Meet OpWalkUSA participant Stephen Martin. He’s pictured here with his Mom and the WOGO team. He’s having a total left knee replacement today. Mr. Martin is a self-employed Project Manager for a house painting company. He was going to have to stop working due to the pain he was experiencing and his mobility was very limited. Meet Mr. Klotz, left total knee replacement. He is a retired mechanic who was forced to retire due to pain. 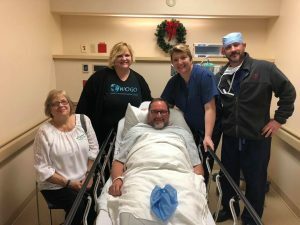 He is pictured here with his wife and sister, WOGO nurse Michelle Burdette, anesthesiologist Dr Kaitner and WOGO surgeon Dr Amanda Marshall-Rodriguez. Me. Klotz is on the road to recovery from his surgery this morning.